The magic of Deva Premal and Miten’s concerts with Nepalese bansuri maestro Manose is captured in this beautifully packaged new CD/DVD combo, In Concert. In Concert contains many of their most inspirational mantras and songs, plus six brand new, unrecorded concert favorites, including the uplifting anthem, In the Light of Love/Om Shree Dhanvantre Namaha. The two hour bonus DVD highlights the extraordinary energy shared by these three gifted artists and their audience, and also includes interviews with Deva & Miten, and other extra features. 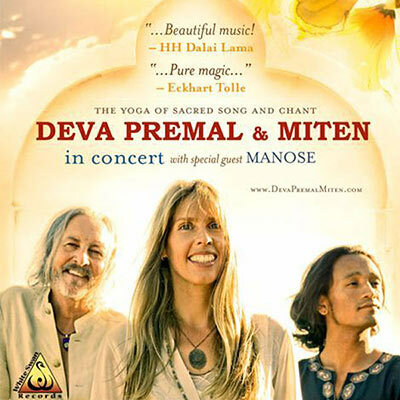 “The latest release from Deva Premal and Miten beautifully captures what has made them famous in concert halls and yoga studios across the planet: well-articulated, melodically based mantras backed by crystal-clear guitars, keyboards, and, thanks to special guest Manose, bansuri flute.